I was checking how my Dad's NPR team did when I came across this picture. Jake's birthday is tomorrow! He's too shy to post about it, but he will be celebrating at Rock Bottom in Bethesda for happy hour (5:30-?). 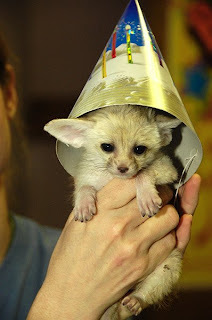 Stop by to wish him a happy birthday! I've been drafted by Max to create a team for this race. Both Reaves and I plan to bring our "A Game" and we need some others. Let me know if you are interested. Max - how many people do we need, how many people score? On business here through Wednesday. Bogotá is not really conducive for city running because it's congested and there's always the fear that you'll stick out like a sore thumb and get kidnapped. Although safer than a few decades ago, you should still be cautious. However, nestled inside the city is a beautiful little park called "Parque Simon Bolivar" which is a little green gem. It boasts a myriad of paved, unpaved and clay trails and although only 2.5 miles in circumference, the trails make it seem a lot longer. The city is 8,661 feet above sea level (third highest city after La Paz, Bolivia and Quito, Ecuador) so I could definitely feel it on today's 7 mile run. If you're ever visiting Bogotá, try Parque Simon Bolivar for a safe and serene run. Can people post (in comments) what races they plan on doing between now and Rockville Twilighter? We can see about adding teams to these races when applicable. BAIN!!!!! So strong, so smooth... didn't that guy crush Boston like six days ago? He is a monster. And DaveOOOOOO, I came up along side of him, we started to roll pretty good, he had that extra gear at the end. Glad to see him back out there hammering away. Always nice to see someone who's battled injuries come back and run well. Boston Ernst? You guys are nuts. Chicago is full. I am going to register for Marine Corps, October 26th. See how training goes, and aim for sub 2:30 I think it is there. I will also be doing boston again. Do others have interest? Jake & I are starting at 9:30am, but in the future, I too would like to start earlier to beat the heat. Christiam, maybe you can start at 8:55am, go 2.5 miles South starting from Lock 5 and then loop back to meet us at lock 5 at 9:30am. I'm starting back up today...slow & easy. I was thinking of running from "The Line" on Saturday...around 10am. Steve Money sent me this link...I found a snapshot of me at every location where they took pictures. This was my first Boston, but I grew up in the marathon's shadow. 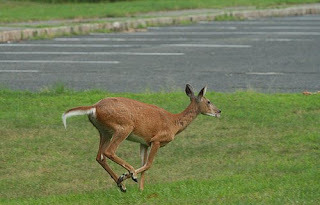 I'm a native Baystater and longed to run the race long before I ever ran a step. As runners, my parents had both run Boston numerous times and I was constantly being toted up to a suburban Boston town by a Grandmother or someone to watch my parents blur past me. Before they arrived, I would marvel at the leaders who all donned singlets from countries I, as a grade schooler, had never heard of. It was an international event that ANYONE could do...if they trained. I arrived in Massachusetts on Saturday evening. My teammate Jason Dwyer and I drove up together and we immediately hit the Boston Expo. I grabbed my number and bombed my way out the door, caught the “T” (train) and grabbed the first bus to Cape Cod. I then went into a nice leisurely rest until Monday morning. Seven of my teammates from the Georgetown Running Company (Washington DC) had arrived in Beantown to conquer the world's most famous marathon. Five of us had a similar race plan and had trained together for the marathon since late last year. Our goal was to run between 2:30-2:35 but we narrowed our goal time to 2:33 after hitting a number of workouts at 5:54 pace. 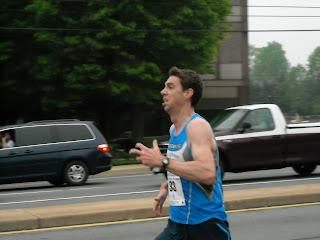 The tentative plan was to hit 13.1 in 1:17ish, maintain pace until mile 15-16 and then see what we had. We had done the work...now it was time to see what we could do. When my bus arrived at Hopkinton a little past 8:00am the scene before me resembled a refugee camp. Skinny nervous characters donning trash bags huddled amongst each other in two large fields behind a high school. Some were jogging, some were sleeping, others simply chatted with one another, and I even saw one person doing some form of Yoga. Lines of people poured out from rows of port-a-johns. Our team of 5 included – me, Patrick Reaves, Jason Dwyer, Patrick Murphy and Chris Bain. We found each other before the race and trekked our way to the starting line. The gun sounded and our 5-man crew pushed our way through the crowded downhills of Hopkinton. The race drops about 150ft in the first ½ mile or so but our plan was to go out conservatively and be able to “turn it on” after the hills of Newton. Reaves and I led our group at the mile (6:04) where we quickly passed Lance Armstong and his posse of Live Stong groupies. The course continues to spiral downhill pretty significantly and we fell out of our pace a little hitting mile 2 in 11:49 (5:44). Obviously the pace seemed fairly easy and we settled into a groove. Our 5-man pack began to pass some people who went out suicidal and hit miles 3 and 4 in 17:38 and 23:47 respectively (5:48s). I believe we were at 2:35 pace after the 5k. Dwyer felt the pace was a bit too quick and told us he was falling back. I half-believed him and half-anticipated him coming back up along side me in a mile, but I took a solid look around mile 5 (29:37) and didn't see him. I quipped out loud “I've lost my right arm”. Our group of 5 was now 4. Reaves and Murphy pushed ahead while Bain and I sat behind the “two Patricks”...still passing people. We hit 5:48-5:52 miles like clockwork until we got to mile 8. Our pace had been a tad fast (wanted to be 5:54) but the downhills made it too easy. My biggest fear was feeling too good and breaking free of the pace and dipping under 5:40, but that, thankfully hadn't happened. Our pack chugged along with a group of other runners. We soon caught a huge group of runners (25) around mile 10. 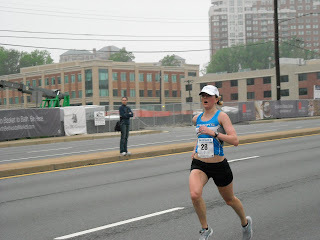 Realizing we'd picked the pace up (52:34 at mile 9, 58:24 at mile 10) I tried to stay relaxed and tell myself I “only had 10 miles to go until the race began” and other helpful hints that spun the race positively in my favor. I felt excellent and knew I would likely run a good time. I heard a spectator shout “get on the train, it'll be faster”. I casually glanced to the left and smiled at the freight train chugging along at 5:35 pace. I felt reserved and ready to pull the trigger and get going. Mile 12 was my fastest mile to date (5:40) and then our group began to pick it up knowing that most of the downhills were now behind us (the first 13 is straight downhill). Before mile 13 I heard a giant roar. At first I thought something bad had happened ahead of us but then I realized we were approaching Wellesley. I muttered “holy ___”. Reaves laughed and said “yeah, really”. A deafening symphony of estrogen soon surrounded us. I flipped up my shades and smiled for the first, and only, time in the race. I ran right along the edge of the female barrier and looked at all the “kiss me” signs and tried to take it all in without picking up the pace. We hit downtown Wellesley and 13.1 in 1:16:15 and now held steady mid-5:40s for the next 3 miles or so. 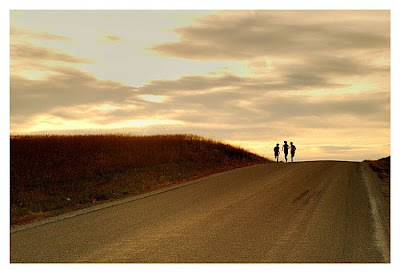 Without realizing it at the time, the race for the finish line was beginning. We looked around at one another. I told everyone I was going to maintain until 18, hit the hills and then see what I had left. Then I said I'd wait until mile 17. We had already picked up the pace and I didn't want to pick it up any more. I caught up to Reaves, who always runs in the front, and whispered “go ahead”. I could tell he was antsy and rearing to go, perhaps this would be his day. He said “no, I am fine right here”. Miles 13, 14 & 15 were 5:44, 5:43 & 5:49. Reaves began to pull away around here. We had picked it up but I was content on trying to hold steady. Bain, Murphy and I watched as our friend soared ahead. The pack was now 3. The crowds were screaming and in your face. Murphy and I got extra attention wearing identical singlets and sporting an identical slouched posture as we battled over hill and dale. We never spoke, but we made an agreement via ESP not to hammer each other during this stretch. I pointed out the Johnny Kelley statue, but Murphy didn't care. I told him we had one more hill to go; Heartbreak Hill (where some half century ago, the famous marathoner Johnny Kelley's heart was broken when a competitor surged past him to take the win) but Murphy only muttered something unintelligible. 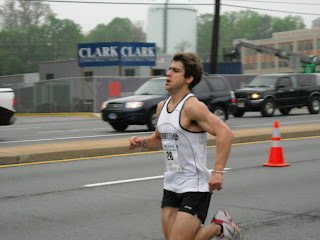 Mile 20 (1:56:45) was run in 6:07...mile 21 (Heartbreak) was a pedestrian 6:22. Still this pace was okay...it was a hill after all? But soon thereafter, the marathon began to be a grind. As we made our descent I turned to burp/vomit but only burped and dry heaved. I was a little dehydrated but the thought of Gatorade made me nauseous. Once in awhile I'd catch the whiff of kielbasa or burgers on a grill and I had to breath out of my mouth so to not smell the culinary odors. I dry heaved at least one other time and decided no forgo all other beverages. Murphy and I were hurting pretty bad. We pushed down mile 22 (6:01) and tried to get away from the deafening Boston College crowds. I hated the cheers, I hated the noise. I wanted everyone to shut up, go home and for the love of God, I wanted everyone to stop cooking Bar BQ along the race course. “Shut up everyone” I told myself, “shut up and die...just leave me be. Let me run in peace.” I was no longer running fast and I felt as if the cheers were actually jeers and the crowd was mocking me. I wanted to get to Boston and get there quick but I wanted to get there without throwing up and/or collapsing. Murphy and I turned left at Cleveland Circle (which isn't a circle) and grunted our way forward. Mile 23 (6:19) and mile 24 (6:14) were flat as a pancake, but my legs wouldn't budge. Again the crowds were deafening and claustrophobic at times as they huddled around the course. If Murphy had worn a different singlet they might not be screaming so loud. Damn it, whose idea was it to have him wear the same singlet! I shook my head and tried to regroup telling myself I had 20 minutes to go, 15 minutes to go...10 minutes to go, but my legs wouldn't respond. I had hit the wall. Get me to the finish, just get me there. Mile 25 was 6:25; I was dying a slow death. I never realized it but Murphy had disappeared. He fell back. Now I was alone...with a mile plus to go I crawled ahead. 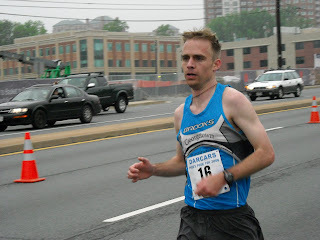 FINALLY I turned the corner at Hereford Street before the final turn down Boylston. My parents said they'd be at Hereford Street, but I never saw them. They were screaming at me, but I never heard them. A handful of runners limped by me but I never responded. If there was a pistol, I would have used it on myself...I was broken and beaten. I staggered home with a 6:23 last mile and immediately began to walk. I hit the finish line in 2:35:48. I've never felt so broken in my entire life. I never turned around and began to simply walk ahead looking for any place to sit down. Eventually I found a curb and decided to lie down. I know from 14 years of running this is the worse thing to do, but I didn't care. Eventually Reaves came over and lifted me up. He was hurting pretty bad too but had run a phenomenal race; 2:31 LOW. Bain had ended up in mid 2:32. Dwyer had caught Murphy and together came in just a bit behind me in 2:36. PRs all around. As a team we finished 4th. My muscles started to spasm and Dwyer advised us to get massages. I drank some water staggered about and made some small talk with my teammates. Then I began to weep. The five of us then regrouped, the first time since mile 4 in Ashland, and headed into the massage booth. We were done. what it is. To me, its the best experience in running. Two days of fun capped off with a 26.2 mile run. Great run all. Everyone ran as well as their bodies would allow which, is all that can be asked for. 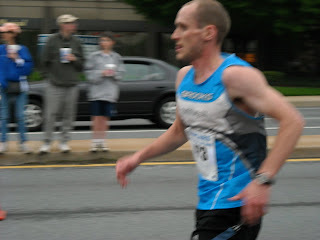 I figure that the best I can do now is 2:47 or so since that is what I seem to run in my most recent marathons. The endurance is there but thats it. Speed work is needed. Felt great today and simply ran the same speed more or less the entire race. The hills were fine and the crowds, awesome. Body never felt stressed. You guys who PR'd are awesome. All of the speedwork and hard long runs have paid off. I love this race for so many reasons. I had a blast. After the race, my hammy was really spazzing so some lady with a WICKED strong Boston accent put me in a wheelchair and brought me to the massage tent. WICKED good service. After that I walked 3 miles back to my house in Cambridge where I soaked in an epsom salt bath to relax the muscles. Felt great after. upon leaving the bath of glory I went to visit Klim and Co and then came home(where I am now). Presently cooking a real good dinner and having a glass of vino and just loving life. My moma bought me organic food and magic potions to speed up recovery and she has been a real support and kind soul, which always helps. congrats to all and be proud! PS. Murphy, the massge guy called and asked if noon will work. Let me know if that works on your end. Some of the GRC team after the race. In this pic none of us truly realizes how much pain we are in. Congrats to all. Great day for everyone. Phenomenal TEAM performance - I heard we came in fourth...at the Boston Marathon. "It's at the borders of pain and suffering that the men are separated from the boys." Got to see everyone except Matt Earnst today and relayed the switch in the meeting destination, so we should be square, but fyi- we're meeting in the village, next to the band stage, where Bane suggested in an earlier post. Looks like we'll all have our cells on. I plan on being in the village around 8 ish. Bane, Patrick^2, and jake, don't forget your t-shirts! I got in Wednesday and the weather here has been spectacular. Yesterday it was almost too warm: 53 degrees at what will be gun time and climbing to the day's high of 55 three hours later. Preparations for the 112th Boston Marathon are well under way as the city has taken on a nervous anticipation. Everyone's talking about it and folks are excited. I wish everyone could experience this at least once in their lives. REGARDING RACE DAY, JAKE AND I THINK ITS A GOOD IDEA TO MEET AT THE STARTING CORAL AT 9am FOR GROUP HUG AND KISS SESSION:) I WILL BE LINGERING AROUND THE FINISH AS WELL. IF ANYONE HAS A SUGGESTION REGARDING ANOTHER PRE-RACE PLACE TO MEET, LET US KNOW. 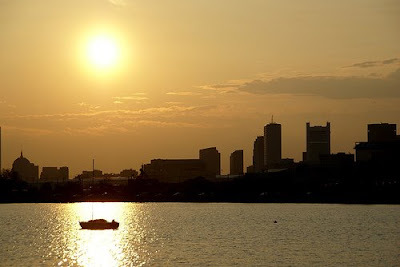 FYI________I AM MEETING SOME FOLKS AT THE MASS AVE BRIDGE IN CAMBRIDGE TO WATCH GIRLS TRIALS ON SUN. IF INTERESTED IN MEETING UP SHOOT ME AN E-MAIL THIS EVE OR TOMORROW. ...is officially working. Right now it just forwards you to the Active registration page. Make sure to let all your friends and enemies(i.e. Pacers) about the race. There will be a team competition so hopefully we can convince some other local teams to attend. If anybody is an html specialist let me know and we can possibly use the georgetown8k.com to host a real webpage. Matt Ernst told me about these...I'm downloading them now for the ride to Boston. A number of us won't be around this weekend for runs. If someone wants to take the lead in organizing this, this is certainly the forum to do so. Did everyone see/hear about the Ryan Hall performance in London. 2:06:17. And he came in 5th. What a tremendous effort by all of the top runners. 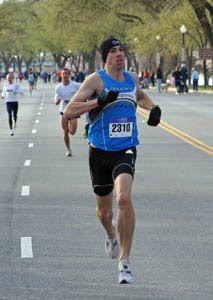 Ryan must now be considered one of the top 5 or 6 marathoners in the world. Truly incredible story. "A gradual reduction in training load in the period leading up to competition. Tapering is particularly important for those preparing for endurance events. It gives the body an opportunity to recover fully from months of heavy training and to adapt to increased demands. There are many examples of athletes who performed exceptionally well after they were forced to rest against their wishes. 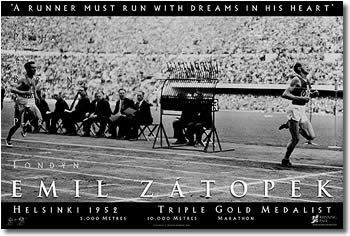 One of the most famous was Emil Zatopek who was training very intensively for the 1950 European Games when he became ill and had to stay in hospital for two weeks. He came out just 2 days before he was due to compete in the 10 000 metres. He won the race convincingly by more than one lap. He went on to complete the ‘double’ by winning the 5000 metres. Zatopek's performances demonstrated the benefits of tapering so clearly that their effects are sometimes called the ‘Zatopek phenomenon’"
... in front of the GRC store after the run. I PROBABLY WILL NOT BE ABLE TO BUT IF OTHERS ARE INTERESTED, IT SHOULD BE ON TV SOMEWHERE/SOMEHOW. RYAN HALL WILL BE DOING HIS THING. IF SO INCLINED, SOMEONE MIGHT TAKE THIS IDEA AND DO SOMETHING WITH IT. 45-60 degrees sunny or partly cloudy...circa 50 during marathon (?)...developing. I suggest we meet at the GRC store this Sat at 8:30am for one more run of love before the mighty attack on Beantown. I feel sort of like some character from Lord of the Rings who is about to embark on a journey that will bring about near death and destruction but where true glory can be achieved. In any case, what about run for 12 miles or so on Sat and then head to S-bucks on M st for a cup of joe? I suggest 8:30am because I need to be done with the run by 10ish. 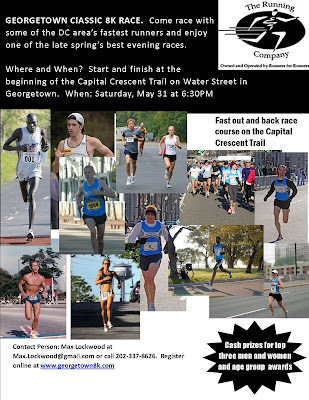 I am working on behalf of the GRC to put on a 8K race on Sat the 31st at 6:30PM. Its called the Georgetown 8K. There will be ample prize money and festivities. Anyone on the team is of course, welcome to run it and preferably, I would like a team of folks to do it. Its an out and back on the Capital Crescent beginning on Water Street and heading up the trail and then turning around and coming back. Please spread the word to those who might be interested in running. Those on the team who want to run it, please contact me directly. Second, for those who are not running, please consider volunteering with water and race logistics. If so willing, please contact me. Well, only 5 had signed up- i think I should have made it clearer there was no $, just pride. Bane wins, no matter what the outcome tonight. He picked conservatively and has Mephis winning. I too picked memphis, but had more losses along the way. 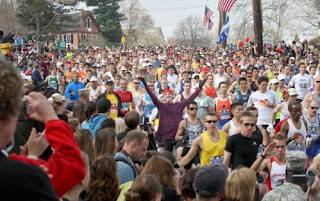 For those running the Boston Marathon, I would like to organize a post race event of some kind. I am not sure the venue as of yet. Maybe downtown, maybe at my house in Cambridge, etc. 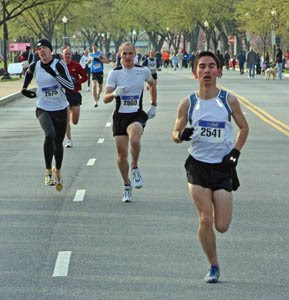 This would be open to all people including other DC area runners doing the marathon. There are so many from the area running the marathon, I think it would be a good gesture on our part to at least lead the effort and see how it materializes. Jake indicated he is going to go to his parents house on the Cape and die after the marathon. Others, I assume, have other plans. Who else might be interested? So I decided to wear a heart rate monitor for Cherry Blossom to try and help determine/undestand what goes on inside the body during a race. The figure on left shows average heartrate during each mile of the race vs mile pace as the race progressed. (2) Even though pace and effort were maintained throughout the first five miles, heartrate slowly increased. A quick Google searched revealed the increase in heartrate may be attributed to Cardiac Drift. During long and strenuous workouts, the heart has a tendency to beat slightly faster even though you do not feel as if you are working any harder—this is called cardiac drift, or cardiac creep. The heart rate increases even for the same effort expended because as you sweat, your blood volume decreases due to fluid loss and also your heart tries to do its part in regulating body temperature. Is anyone interested in racing the Pikes Peek 10K on 4/27? that was a fantastic race yesterday. everyone ran well. even though we were bested by pacers for the team prize, we take the cake for having the largest contingent of quality runners out in full flight. There must have been at least 12 of us running not including multiple sightings of Dave Os and Matt Es to cheer us on. Keep up the great running. Nice races everybody. Thanks to Jarrin for sending me music for the video. I'll be warming up for 20 mins...starting at 7am from the starting area. I understand the logistics are ridiculous for this race, so if we see you there great, if not, we'll touch base post-race. Warm-up will commence at 7:05am...try and get there circa 7am. Spent this past week in Las Vegas at a trade show and flew this morning to Denver Colorado. Ever since meeting the group last Sunday at the line my right knee has been abysmal. It started the week before, got better and now is ruined. It's the top part of the knee cap (medial side), where the cap (patella) ends and tendons and ligaments presumably attach everything to your quad. Excruciating and constant pain. While sitting, while walking and pretty much anytime I bend my knee. Feels like someone is sticking a hot searing poker through that tender area and then under the cap. I had planned to run through the Red Rock valley while in Vegas, go skiing today in Vale and then run 12 miles in Boulder (inset picture) before coming home tomorrow. None of it happened because in addition to my lame knee, I've had some kind of abominable flu producing a high-grade fever for the last three days with body aches like someone is continually beating me with a rubber hose. I pretty much feel like MAX. I cannot get to the Packet Pickup tomorrow for the Blossom. I would like someone to pick up my bib, chip, shirt(size large), etc. Mighty Murphy, Bain, Reaves, Klim, whoever, please give me a shout out tonight! Meeting Location: If driving, enter parking area at East West Highway just east of Beach Drive by Meadowbrook Stables and follows signs around to meet by Candy Cane City Playground and Clubhouse. Site is fine for all age groups with plenty of diverse areas to cover. Dogs welcome. The infamous Chuck Moeser just told me that by October he will be able to beat anyone on our team in a race. I told him that if he is able to accomplish this feat we owe him a night on the town. I have usually neglected to stretch. In fact, sometimes I purposely do not stretch before a race because it makes me feel as though my muscles are more responsive. Recently, however, with the increase in my triathlon training, I have encountered two injuries that could have been avoided through stretching exercises: an IT band injury and a torn calf muscle. The calf muscle injury is particularly disheartening because it keeps from racing in the Cherry Blossom 10 Miler this weekend. I am upset, to say the least. My injuries show that I am on somewhat of a steep learning curve with regard to my training. I was not a Division I athlete and therefore do not have a truly comprehensive understanding of athletics and racing. In fact, until recently, stretching was seen as somewhat of an annoyance, something that was tangential to my race goals and training schedule. But I am quickly seeing the error in my ways. Without stretching (or massages), I believe one is only able to perform up to a certain level, a plateau if you will. But in order to be at the top of the pack, small things need to be taken into account, things like hydration, sleep, and muscle looseness. These are things that can be overlooked by the average run-of-the-mill athlete, but not someone who is looking to outperform the majority of the competition. Best of luck to everyone who is racing. Dunno. These are just my thoughts. Come to the Georgetown Running Company in Chevy Chase, MD on April the 5th between 11am and 2PM to learn about the importance of strength and cross training to improve your running. On hand will be one of the region's best Personal Trainers, Taliaferro Warren, to talk about and demonstrate some of the techniques he incorporates into his PT menu to assist runners in the areas of injury prevention and muscle development. Taliaferro- or "T" as he is known- is a NASM-Personal Trainer and an 8 year veteran of the fitness industry with experiences working with; youth to the elderly; physically challenged to professional athletes start up Personal training companies to national fitness chain. His ability to translate his passion and commitment by helping others make positive life changes by achieving their health and fitness goals, allowed him to immediately become a top-selling Personal Trainer. He has received national media exposure for exceptional his work with athletes and public speaking on health and wellness. Taliaferro will be bringing his unique talents to the Georgetown Running Company on Saturday, April 5th. He will be providing on site, Posture and Movement Assessment along with exercise tips based on the findings. Movement assessments are dynamic observations that show postural distortions and potential overactive and underactive muscles in it naturally dynamic setting. This type of assessment can be done on any person of any age range and fitness level. The store is located at 4461 Willard Ave in Chevy Chase. The Friendship Heights metro is ¼ mile from the store. If coming from the metro, exit the metro and cross Wisconsin Ave. Then precede to walk down Willard until you come to the store. The store will be on your right. If anyone else we train with has an online log/blog, can you please post in "comments" below? I'd love to add them to the column on the right. It's great to read everyone's workouts/training info...but more importantly how everyone is "feeling" during them. I know I'm not alone. If I had one, I'd add it...but I kant tipe worth a damn and instead write with a Cockatiel Quill Pen by candle light. Since running the National Marathon without any thought or prep, I can say that Reaves, Klim, Bain have a shot at dipping below 2:30. I mean, you guys are logging over 85 miles a week, racing, doing track workouts and seem to be injury free. Its all in head now. If you run a somewhat intelligent race, are healthy and the weather is OK, the world is yours. As for me, I plan on doing what the day allows for. Also, who is game for watching the women's trials that weekend? Who plans on running? We can register as a team, but if you're interested let me know ASAP. I have a feeling this race will sell out soon. My plan is to peak again in late September/early October so this will fit in nicely.